In a West-End musical where the actors have not learned their lines or dance routines, the musicians do not know their score and the writer has barely written even the flimsiest of scripts, one simply cannot know what to expect. We often hear people say “I’ve never seen anything like it,” but this is the one time that is absolutely true. The next show will be completely different, as will the one after. The premise of the show, as we learn within the first few minutes, is a writer (Dylan Emery) who, having had a script turned down, announces on a whim that he has another ready to go. As the producer asks for details, Emery uses the audience’s suggestions and we ended up with a musical called “It’s Torture,” set in a burlesque club and ice cream parlour in the late 1950s, with musical influences from Sondheim, Jack Johnson, Chopin and Bollywood. Certainly not your usual West-End show! From these basic ideas, the actors take to the stage and, between them, weave together an entirely improvised storyline and characters in keeping with the setting and era. The story is moved along in places by Emery, who announces new scenes and takes further direction from the audience on how the show should proceed. At times, just the look on the actors’ faces at some of these suggestions is priceless. Even without a script or fixed choreography, the show is fast paced and the whole cast take sudden announcements in their stride. One of our characters announced she was pregnant, which the other cast members reacted perfectly to, and wove that into the story. I was amazed at the speed in which the actors came up with their lines and dance routines, with barely a pause for thought. Two outstanding sections for me were the brilliant Sondheim-inspired multi-layered song, in which each actor kept to their story and character with apparent ease, and the Chopin-inspired piece. The Bollywood scene also had me in stitches. Julie Clare was outstandingly fast and hilariously funny. This is someone who knows exactly what she is doing – and she does it brilliantly. Showstopper is apparently her first time at improvisation, but she’s a natural. Pippa Evans shone in her excellently improvised dance routines which told a story on their own. She has a wonderfully expressive face and is also ridiculously fast at thinking up new lines in a split-second. Ruth Bratt is cheekily fabulous throughout, and was responsible for the pregnancy storyline, which was a touch of absolute genius at the precise point she threw it in. Dylan Emery excels in bringing the story together and moving it along to its wonderfully happy conclusion. Adam Meggido got one of the loudest cheers of the night, by bringing the musical’s title – It’s Torture – into a song; again, at the perfect moment. During a couple of numbers, he also appears to direct the cast which, if so, is done with absolute precision but discreetly enough that it would be unnoticeable to many. 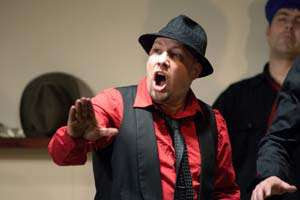 Philip Pellew was incredibly fast at finding his character and has a clear command of his performance. Andrew Pugsley knew who he was and how to react in every situation his character found himself in. I haven’t done them justice in this short review. The only way I can do any real justice to this most unusual musical is by simply saying that you are missing out on something very special if you do not see it. Showstopper is, quite simply, one of the most brilliant things I have ever witnessed on a West-End stage. 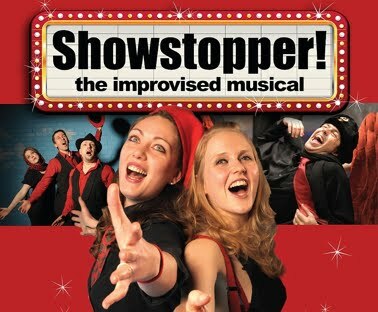 Watch www.showstopperthemusical.com for further dates and to view details of the previous 327 shows – each one different!